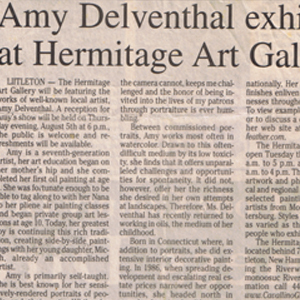 LITTLETON – The Hermitage Art Gallery will be featuring the works of well-known local artist, Amy Delventhal. A reception for Amy’s show will be held on Thursday evening, August 5th at 6pm, the public is welcome and refreshments will be available. Amy is a seventh generation artist, her art education began on her mother’s hip and she completed her first oil painting at age 4. She was fortunate enough to be able to tag along with her Nan to her plein air painting classes and began private group art lessons at age 10. Today, her greatest joy is continuing this rich tradition, creating side-by-side paintings with her young daughter, Micah, already an accomplished artist. Amy is primarily self-taught. She is best known for her sensitively rendered portraits of people and their pets. While she works comfortably in a variety of mediums, she prefers to do portraiture in pastels because of the softness and intimacy they allow. Between commissioned portraits, Amy works most often in watercolor. Drawn to this often difficult medium by its low toxicity, she finds that it offers unparalleled challenges and opportunities for spontaneity. It did not, however, offer her the richness she desired in hew own attempts at landscapes. Therefore, Ms. Delventhal has recently returned to working in oils, the medium of her childhood. Born in Connecticut where, in addition to portraits, she did extensive interior decorative painting. In 1986, when spreading development and escalating real estate prices narrowed her opportunities, she headed north in search of a simpler lifestyle in which to raise her children. With family taking the front seat, her portrait business grew slowly. In 1990 she realized her dream of painting professionally again and has never looked back. 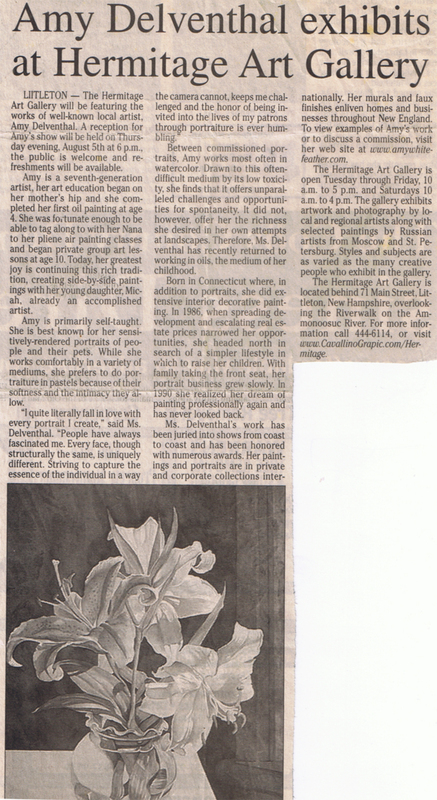 Ms. Delvethal’s work has been juried into shows from coast to coast and has been honored with numerous awards. Her paintings and portraits are in private and corporate collections internationally. Her murals and faux finishes enliven homes and businesses throughout New England. To view examples of Amy’s work or to discuss a commission, visit her website. The Hermitage Art Gallery is open Tuesday through Friday, 10am to 5pm and Saturdays 10am to 4pm. The gallery exhibits artwork and photography by local and regional artists along with selected paintings by Russian artists from Moscow and St. Petersburg. Styles and subjects are as varied as the many creative people who exhibit in the gallery. The Hermitage Art Gallery is located behind 71 Main Street, Littleton, New Hampshire, overlooking the Riverwalk on the Ammonoosuc River.